Firefox browser has a little bandwidth hungry feature which downloads the pages which it thinks you may view. When a webpage hints Firefox that certain pages are likely to be visited, it automatically downloads them so that they can be displayed immediately when the user requests. 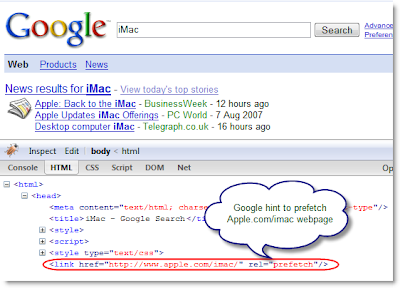 For example when you search Google for iMac, Google Search results webpage hints browsers to pre-fetch http://www.apple.com/imac/ webpage. it just excellent trick.i have done,yet,now i feeling tht my internet browsing speed has been boosted.thanx for this nice trick.